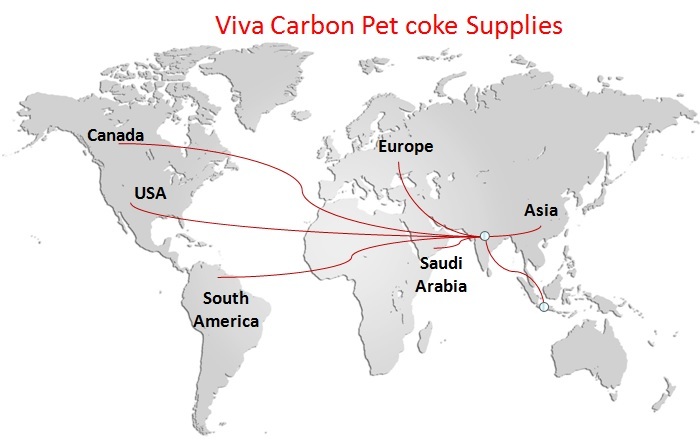 Viva Carbon is among the top pet coke suppliers in India of Fuel Grade Pet Coke and Anode Grade Pet Coke - US, Saudi Arabia, Venezuela, Canada, Chinese pet cokes. We are preferred pet coke suppliers to leading cement, calciners, chemical and steel industries in India. Customers value our consistent quality, reliable supplies and personal service. Petroleum coke (Pet coke or Petcoke) is a solid by-product of the petroleum refining process. Based on the pet coke uses, it is classified as Fuel Grade Petroleum coke or Anode Grade Petroleum coke. Fuel Grade Pet coke is used as a fuel in power plants, cement kilns, steel industries, blast furnaces etc. Fuel Grade Pet coke accounts for over 80% of the global pet coke production. Anode Grade Pet coke or Raw Pet Coke (RPC) or Green Pet coke (GPC) or non calcined Pet coke is used by calciners to produce Calcined Petroleum coke (CPC). CPC is used in aluminium, graphite electrode, steel and titanium dioxide industries. Viva Carbon sources Fuel Grade and Anode Grade pet cokes from major pet coke producers in the world. Our customers thus have access to a wide range of pet cokes.